One of my best friends in getting married next May and organised a get together this weekend for her bridesmaids (plus one of the flower girls) to go with her to the wedding fair at Earls Court and various other wedding planning things. 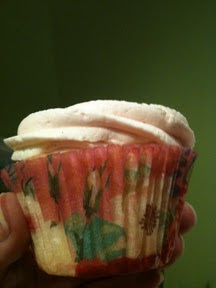 On Saturday evening she planned a girly night and I took some cupcakes over. In keeping with the girly theme I decided to go all floral and pink with a touch of glitter! I used some lovely floral cases and displayed them on a floral card base. The cupcake is a vanilla sponge but I followed the advice in Oliver Peyton's British Baking book and weighed the eggs (with the shells on) and used the same volume of flour, butter and sugar. I used two medium eggs so this was 39g eggs, butter, self raising flour and sugar and I added 1/4 tsp baking powder and vanilla paste. It wasn't a bother weighing the eggs and I do think it resulted in a slightly better texture. I would like to try it when I'm next making a Victoria sponge. 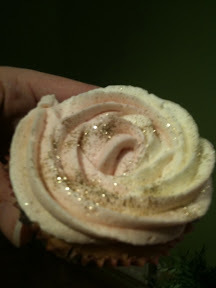 Once baked and cooled I cut a small hole from each and filled with a hulled strawberry and topped with a mixture of pink and white vanilla buttercream and a touch of glitter. 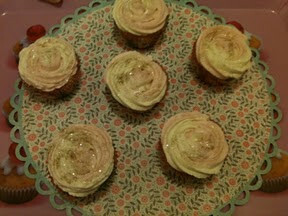 For pictures of the strawberry in the centre please see my previous blog post 'cupcake heaven'.